GDS User Research Lab observation room. Note the 18% neutral grey wall colour. Detailed notes from from two talks at the Government Digital Service (GDS) User Research Meet-up. Need to hire a UX lab in London? 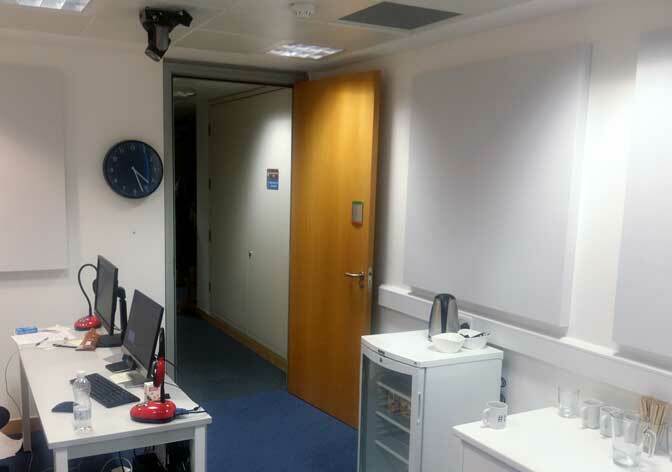 Read UX Labs in London; Spaces for usability testing and user research. Craig Spencer, a UX Research Manager, shared his experiences re-building, creating and influencing UX labs at Betfair, the Guardian and Tesco PLC. 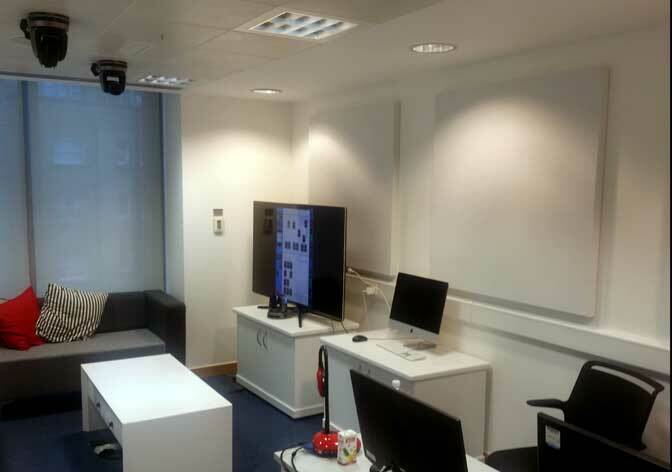 Kate Towsey, Content Strategist/User Research Technologist at GDS and the BBC, extended this with her reflections on setting-up the GDS user research lab. Lab success: what if it works? Begin by assessing the stage of development for UX activities in your organisation. Is there still initial hostility towards user research activities? Is there widespread reliance on close contact with customers? Is the lab part of bricks and mortar digital transformation? If the latter then the buy-in and utilisation of any user research lab will be much greater. If the former then question whether a UX lab is the correct approach at this stage. Morae RP and guerrilla testing — if done well — can help you get to the stage where a lab makes sense. Remember also that building a lab doesn't change stakeholder behaviour. It can "remove the excuse" from Product Manager's. It might create some champions. Yet you will likely need to reach further into the organisation. Consider a 'three-line whip' to make attendance at current user research sessions mandatory for select stakeholders. It is essential to collaborate with the Finance team and senior stakeholders who will authorise the budget. An interaction lab requires investment and iteration over time. Good relationships with these stakeholders can help you unlock budget in later years. taking stakeholders on lab tours so that the ‘penny drops’. exploiting any capital expenditure gaps and the budget cycles. identifying opportunities to let Finance projects use the lab. whether investing in a UX lab is seen as a cost, or as a value centre? can the business use the lab space in any idle times? the return on investment (RoI). GDS estimate that their in house user research lab is ±25% cheaper than hiring. It will pay for itself in ±2 years. the opportunity cost of ‘building the minimum’. It can be expensive to expand the capability of a lab built to a constrained specification. Interaction labs can cost over £100,000 (source: the Guardian lab). In large organisations these costs can be — or can be seen to be — relatively small. Understanding the costs and value derived from an interaction lab can be very empowering. 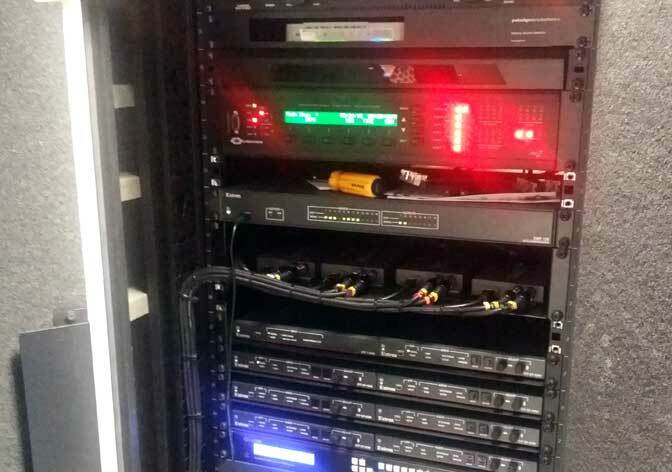 The audio / visual matrix router is likely to be the biggest cost. The lab can pay for itself the organisation is testing frequently. This return is derived from to improvements to the products and from not needing to hire external facilities. In-house labs can lead to higher quality research and collaboration inside the organisation. There can be greater agility and utility in user research activities if the lab is used well. Especially versus the financial and task switching costs of external labs. It's en vogue. There is "definite growth" in on site user research labs, especially as companies bring UX research in-house. Treating the design of the user research lab like an Architect can be a good use of your time. It can be expensive to change your set-up if you get things wrong. Get deeply involved in the look and feel of the design. Particularly if Facilities or Finance take too much control. camera angles and microphone placements. space (re)configuration for other user research activities like focus groups and interviews. is the lab purely for 1-to-1 facilitated sessions, or is it also a design space? location of specifics like plug sockets, light fittings and furniture types. hold contractors to plans and deliverables. Aim to physically demonstrate equipment selections. Ensure that there are room for additions, like extra cameras and inputs, in the set-up. Avoid building to a minimum specification with no flexibility to grow and develop over time. A minimum-viable product (MVP) approach to lab creation is likely to be a false economy. move location when buildings and spaces change. adopt new technologies and research approaches. grow if the rate and quantity of work increases. High definition (HD) files will have very large sizes and these will grow exponentially test-on-test. If user testing at scale, at pace and over time then think about how to catalogue research outputs. In particular to make them reusable and indexable for future and follow-up studies. One-way mirrors or TV walls? It's very difficult to design effective one-way mirrors. Making them soundproof and truly one-way is problematic. This is without the structural complexities of finding a viable location in the building for the lab, observation room and its mirror. 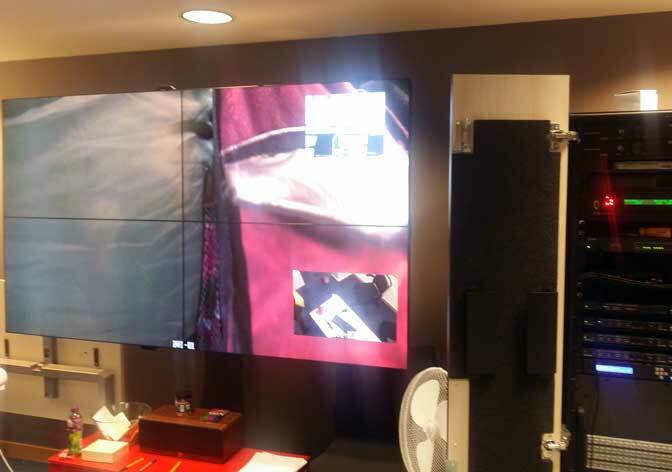 In most circumstances it is simpler, faster and lower risk to set-up a TV wall in the observation room. Consider the needs of those invested in the outputs from the lab. Thinking about their needs during the scoping phase will save time and money later in the project. Do they need to see live sessions, recordings, or both? Do they need to work in the space, or merely observe? How does the interaction lab handle participants or stakeholders with diverse needs? The look and feel of the interaction lab is essential to set participant expectations and to influence their performance. Factors like temperature, lighting, colours, texture and furniture can create the right vibe. Reusing existing office furniture can easily recreate a sterile and corporate environment, rather than something welcoming and relaxing. beware pressure to allow fittings and furniture to be removed from the project budget. Build time into the project planning stage to persuade Facilities and Finance. This is one of the addition reasons to take them on lab tours. Details like GDS's "18% warm grey" matt paint for the background for their TV wall can make a real difference. beware becoming too lab focussed if your lab is too successful. For example: forgoing ethnographic techniques because you are too grounded in the lab. Build in the capacity to grow the lab and its capabilities. Consider the costs of needing to manage the lab, perhaps full-time. A matrix audio/video box of tricks. The heart of the lab and its biggest expense. 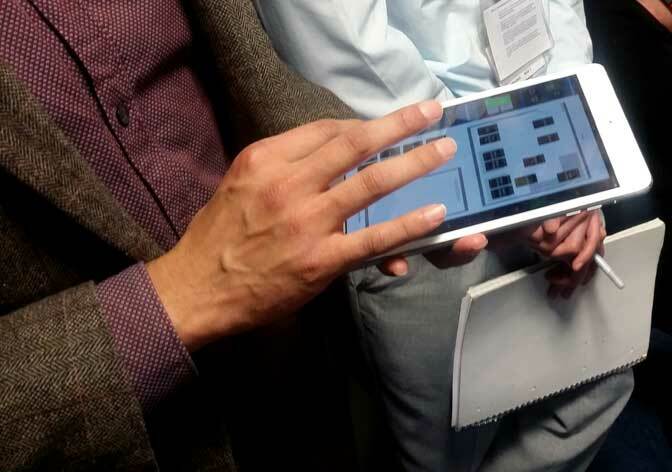 An iPad mini coordinating all hardware, software and presets therein. Interaction Lab with ceiling cameras, (mostly) matte surfaces and neutral decor. Another angle: super-useful oversize logging clock and refreshments.